” Ways To Stop Animal Abuse Ву Raising Awareness Adverts contribute towards site running costs, but currently may not fit with the site ethos. We will continue to work on a solution. Do A Presentation or Talk To Community Groups or Schools. You can help stop animal abuse by raising awareness of it. The more people who know about it, the more people who will want to help stop it. 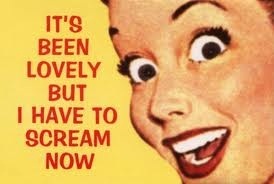 Sometimes people who you didn’t think were particularly compassionate will pleasantly surprise you! There are a number of different ways you can raise awareness of animal cruelty and suffering. These are just some of them: Using the web; giving out leaflets and flyers; putting up posters; using your voice; doing presentations at school, college, or to community groups; displaying messages on your clothing / other accessories; doing protests and demonstrations. You can help raise awareness of animal cruelty by sharing information and images you find on this website, or other animal advocacy websites, onto social media websites. You can also let people know how they can help stop animal cruelty buy sharing information You find on this, and other animal advocacy sites. If people read your post, it may make them feel like they want to do something to help stop animal abuse. It is therefore good to also include links to web pages about how they can help stop animal cruelty. Petitions to stop animal abuse are also good to post on social networking website pages, along with an explanation of what they are about. See the Campaigns and Petitions page for advice on which petitions are most effective so your time is not wasted. There are also instructions on that page on how to automatically fill in petitions, avoiding having to enter your details each time. If you share that information by posting a link on social media to the Campaigns and Petitions page, it may encourage people to sign more petitions, as it will be easier for them. All these things are also good to do if you wanted to create a blog or glog (graphic blog) to raise awareness and encourage people to help stop animal abuse. Tactfully and respectfully post in pet selling groups encouraging people to save innocent lives by fostering or adopting a rescued pet. 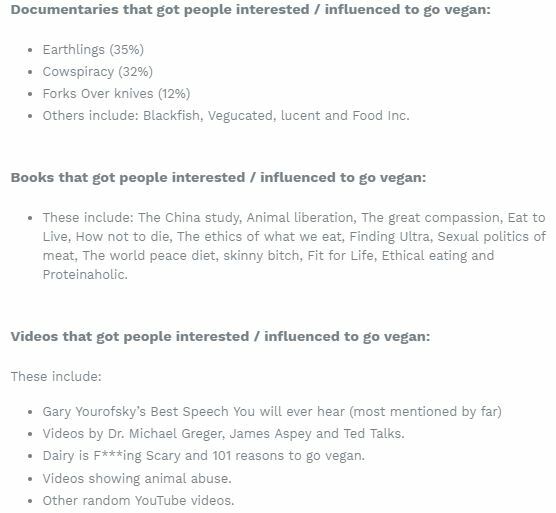 See the next section for how to reach people who do not want to know about how they cause animal suffering with their every day choices. Many people choose to be wilfully ignorant about what happens in the animal agriculture industry. They would simply rather not know. They prefer to be able to carry on making the choices that cause terribly cruelty, without feeling guilty. We have a page explaining the most effective ways to cause change, here. 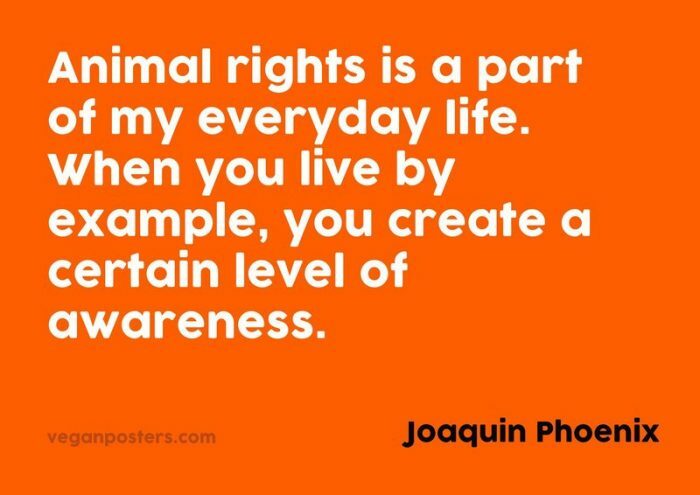 The page also helps animal activists know the importance of looking after their own minds, and how that helps animals. The page is aimed at people who would normally turn away from anything they knew would be educating them about the cruelty involved in animal agriculture. By piquing their curiosity with certain styles of headlines, they will be tempted to look, which means they will learn as a result. Simply click on the social media icon at the top of the page, or in each section of the page. Alternatively, copy the URL (web address) and paste it onto social media sites. Warning: on the pages there are graphic content which more sensitive people may find distressing. To encourage people to help stop animal abuse, distribute material which helps raise awareness of animal cruelty and suffering. 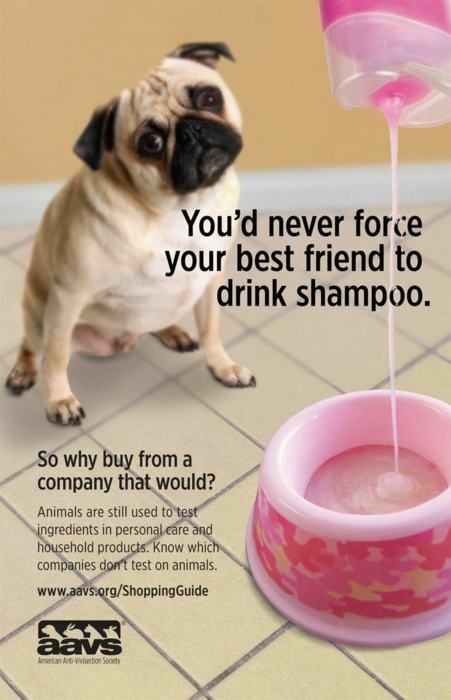 Posters, flyers and informative leaflets are available from a number of major animal charities. You can actively hand them out to people, or simply leave or display them where they will be seen. You could set up an information stall, display the posters on it and give out the leaflets, flyers and posters to members of the public on the street. 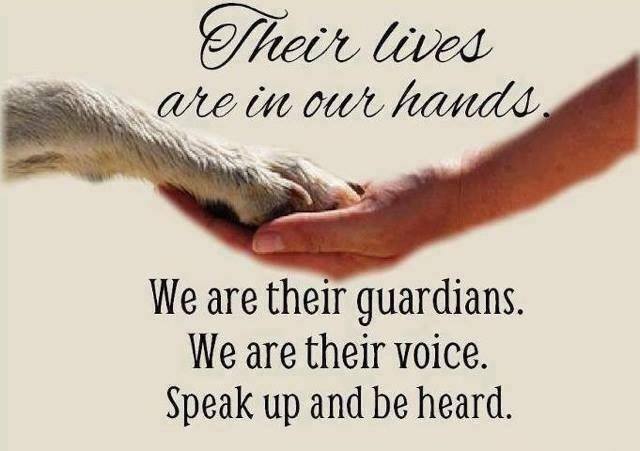 You can design the leaflets and posters yourself using pictures and information you find on the internet, or you can find animal charity and animal rights websites that have them ready made for people to distribute. You could even give out samples of vegan “cruelty-free food & drinks” that you have made from your information stall to show people how delicious it can be as an alternative to food funding the cruel meat, dairy and egg industries. I have even seen these information stalls combined with a small tombola, or offering cups of soup on a cold day for a small donation, but you would need to check if a license is required for accepting donations of money. 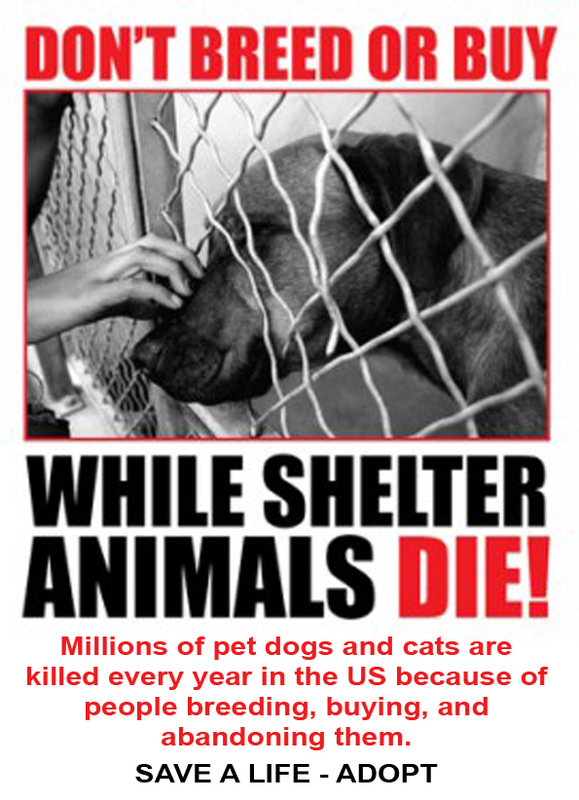 Image: Example of a poster urging people to adopt pets instead of buying them or breeding more. Posters could be displayed on public or community notice boards, shop notice boards, shop windows, in workplaces, community centres, church halls, or in your car windows. If you live somewhere where people pass your house windows, you could display posters in your windows. You could also leave flyers and leaflets in your workplace, medical waiting rooms, and anywhere else people are likely to see them. If you receive animal charity newsletters or magazines, leave them in medical waiting rooms for patients to read. Some animal charity and animal rights websites offer leaflets, posters and flyers to download and print. You can find those here. Some animal charities give stickers away for free that people can use to stick on items they send through the mail, on notepads, files, the back of their phones, their laptops, and anywhere else they can think of where people will see them. Some people stick them in public places, such as on benches, bins, and sign posts, etc, although they do that at the risk of getting in trouble with the law! 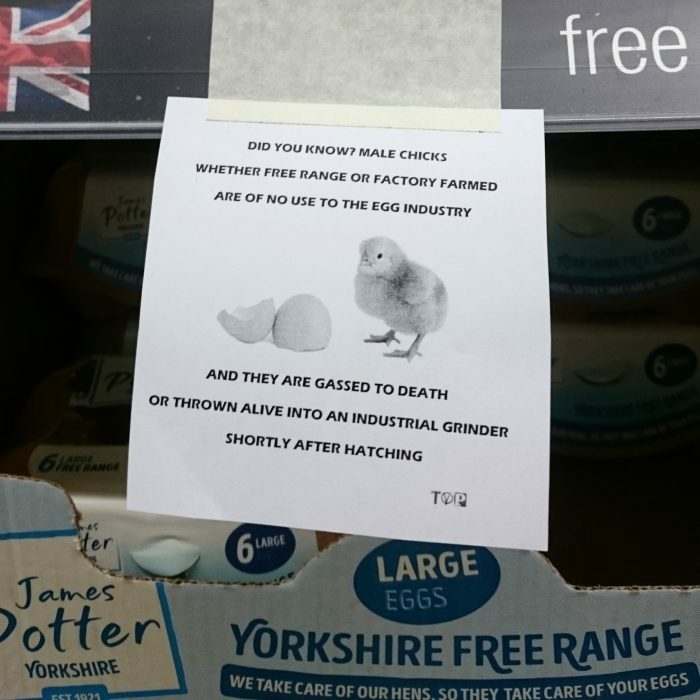 The Vegan Punk website makes simple notices available for downloading and printing, and offers instructions on how placing the notices next to products in supermarkets can be effective activism. Fixing banners to bridges over busy roads can bring the vegan and animal rights message to a lot of peoples attention, You must be careful that it is securely fixed and does not pose a danger by potentially becoming loose. You can also tie banners to railings next to roads. You can use old bed sheets but you have to make sure you pull them evenly taut so your message is easily legible. You can create your banners by spray painting free hand, or there are stencils you can buy which you can use over and over. 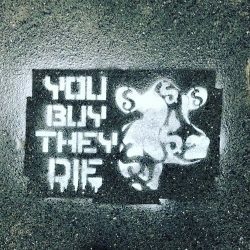 You can also use the stencils for street art, protests and demonstrations banners posters, body art, clothing, or as a projector. Awareness of animal cruelty can be raised if people display messages on them that are against animal cruelty. This could be such things as clothing, accessories, car stickers, pet clothing/accessories, or even your own skin. 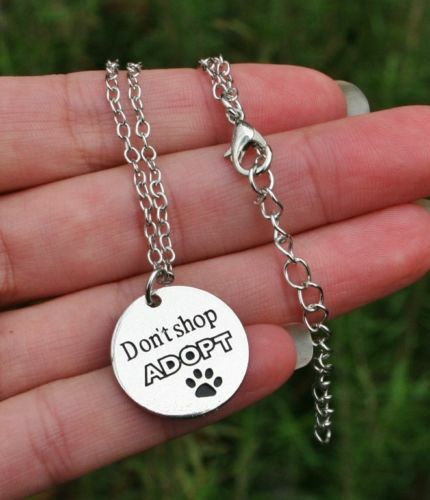 Image: “Don’t Shop, Adopt” animal rescue necklace available in our fundraising store. The message you are displaying may prompt people to ask about it and you can expand on the message, giving them the full story. Once they hear the true horror, it may motivate them to help stop animal abuse themselves. 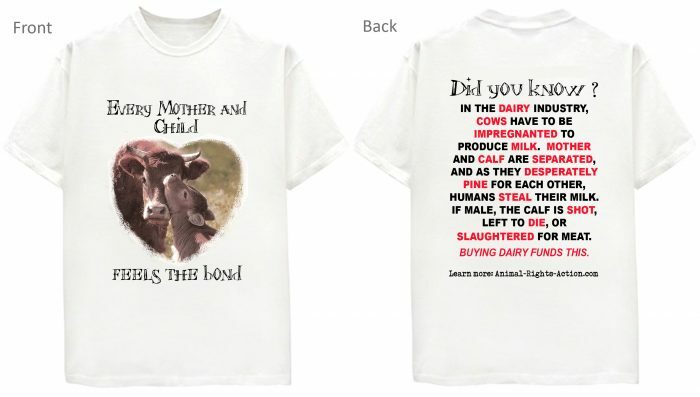 Many major animal charities sell this kind of items. Not only are you donating money to the charity when you buy these products, but you are raising awareness whenever you go anywhere displaying them. We have a fundraising store where you can purchase some such items, and help animals at the same time. 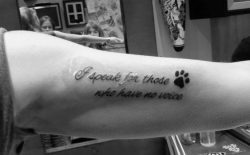 Some people even have tattoos against animal abuse, which can certainly be a good talking point. Raise awareness of animal abuse by doing a project on animal cruelty at school or college. You could choose to base your project on one aspect of animal cruelty, or many aspects of it, depending on how big your project is. There is plenty of information in the Types Of Animal Cruelty section of this website to base your research on. If you wanted to include ways of helping to stop animal abuse, there is the Help Stop Animal Cruelty & Suffering section to help you. 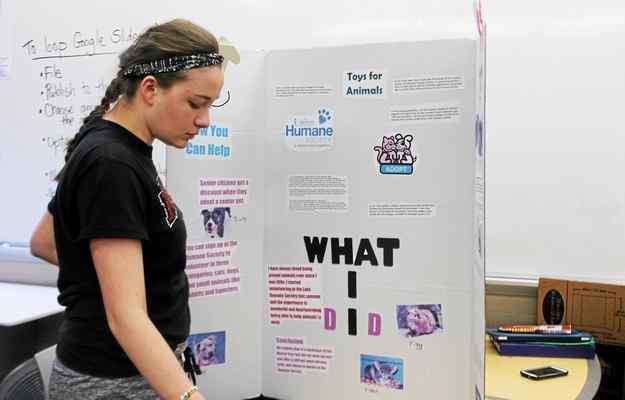 If it is a presentation that you have to present to the class, look at it as a fantastic opportunity to spread awareness of animals’ desperate plight. Maybe you could persuade your teacher to make it a class project. This way involves more people so is more likely to reach people who may want to help stop animal abuse. Some animal charity websites provide free lesson plans and materials for teachers. 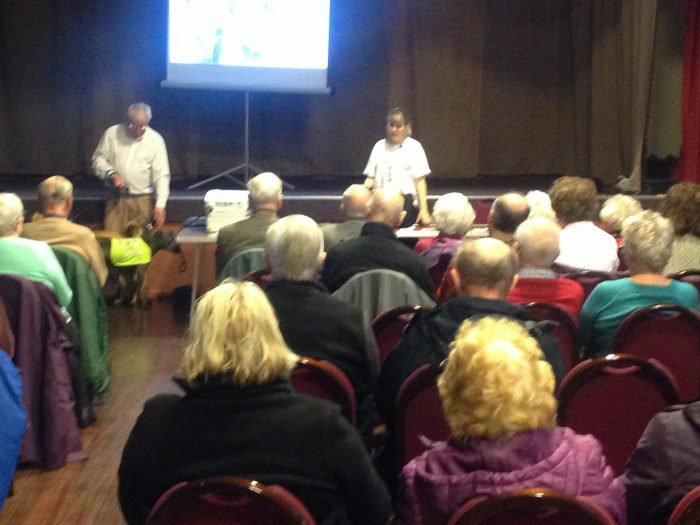 There are often groups and clubs in communities which ask speakers to give them talks, or presentations, in exchange for a donation. You could do a presentation about any of the information you find on this site. I did a presentation to the University Of The Third Age about animal rescue, and used the information on the How Animal Rescue Works Page. You could also approach schools to ask if you can do a talk to the children about animal rescue. Adjust the style of your presentation, depending on which age group you are talking to. By giving a talk, you are helping animals by spreading awareness, and if you get a donation for your chosen animal charity, that is a bonus. 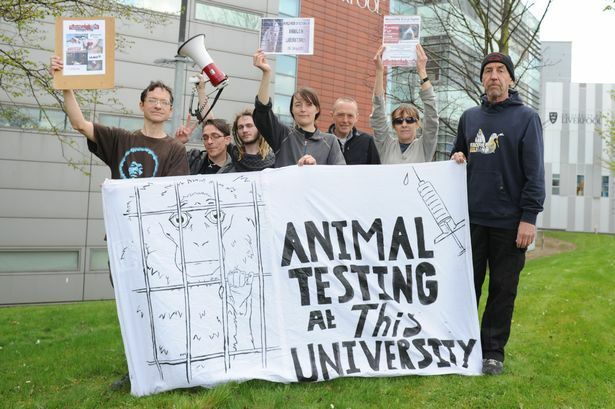 Carrying placards, handing out information, wearing clothes with messages on, chanting, and answering questions while you are taking part in protests and demonstrations helps raise awareness about animal abuse. Protests are often combined with email/telelphone/letter campaigns, and petitions. Find more details on the Peaceful Protest Tactics page. 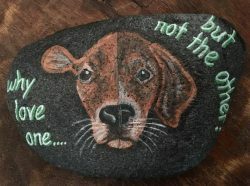 There is a general trend of pebble and rock painting, where both adults and children paint rocks or pebbles with any design they like, then hide them in public areas for families to find them. It is an activity enjoyed by many families. So, it is a great way to get the animal rights / vegan message across. Keep in mind that children may be finding the pebbles and rocks, so it is best to put nothing too gory on the rocks. It is also very important not to stick anything extra on the rocks, such as plastic googly eyes, or foam shapes, as they have sadly caused many deaths of wildlife when used by other people to decorate rocks. Whether you are artistic or not, the important part is getting the message across and raising awareness, as shown in the images below. 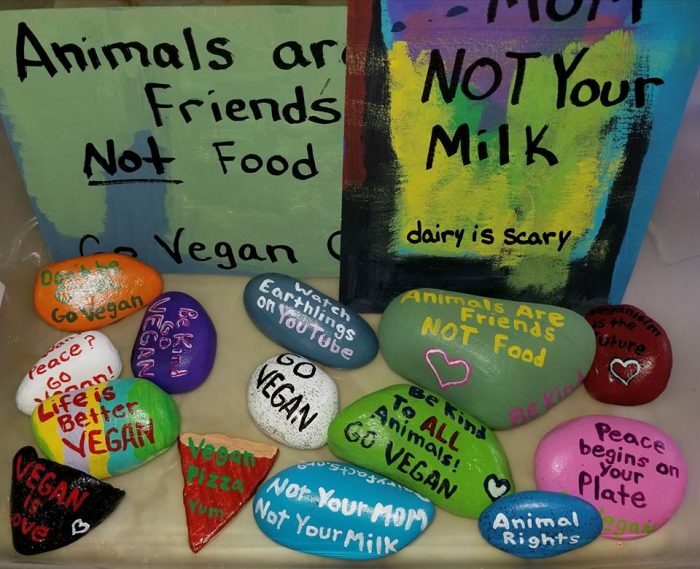 Once you have painted your rocks, upload a picture of them to the Vegan Rocks Facebook page, then hide them in public places that families visit, for them to find. 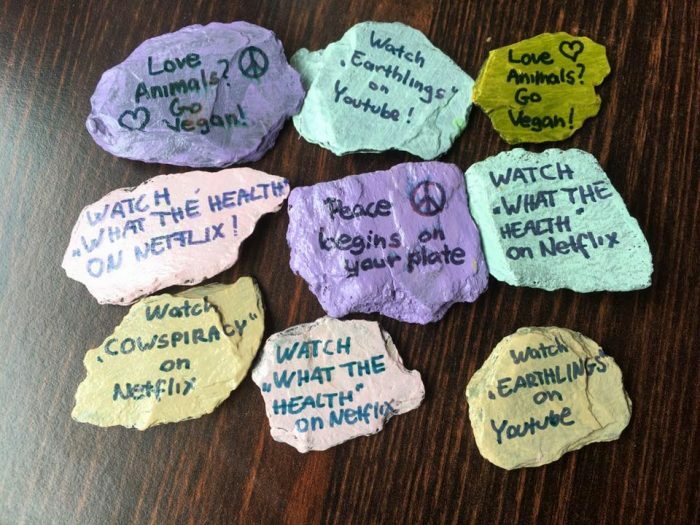 The Vegan Chalk Challenge is a rapidly growing movement of people raising awareness of animal rights issues and encouraging veganism, all whilst being creative and having fun. Write your message clearly in chalk where people will see it, then take a photo and post it on social media. You do not have to have an artistic bone in your body, as all that matters is that the message gets across. Here is the Vegan Chalk Challenge website, and here is their Facebook group and Facebook page. You can get ideas from them and then upload your pictures of your own chalk messages. In the video below, activists have been very creative and come up with something hard hitting. 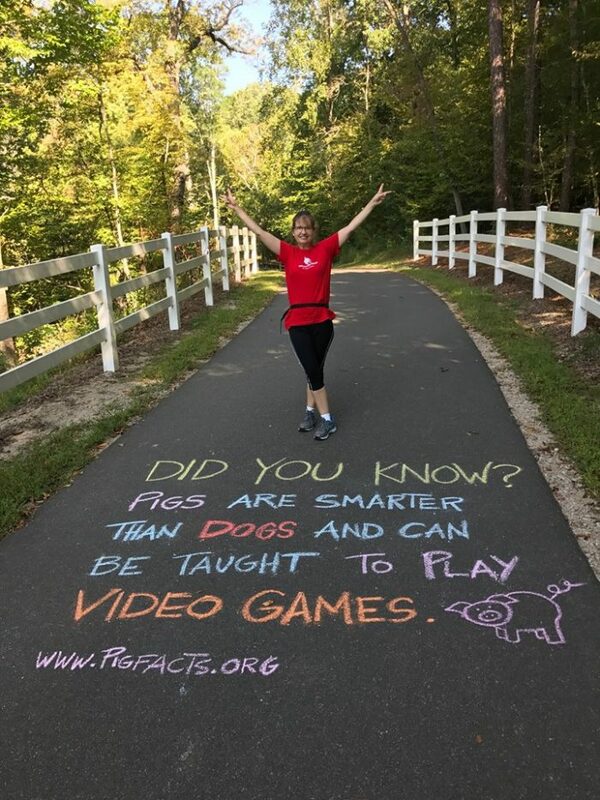 They have combined an audio track of pigs screaming while they are gassed in a slaughter house, with a chalk message explaining what people are hearing. If you own a car, you can raise awareness everywhere you travel in it and park it. 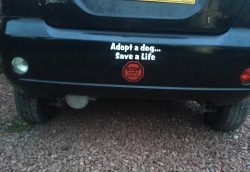 You can buy animal charity car stickers, Animal charities sometimes give car stickers away for free, or when you support the charity. There are also other bumper and window stickers you can purchase and display on your vehicle or in your vehicle windows. You can also order your own message to be made out of vinyl stickers to stick on your car. I have found three sellers offering this service for a good low price. You are free to order your own short animal rights or vegan message. If it is a longer message, you could do more than one order, ordering your message in parts, and then display them together in the correct order when you receive them. You can even make your own car antenna topper with your own animal rights message on. Here is how to go about it. You can also use removable chalk ink markers to write your own messages on your car windows. If you live on a busy street where people walk passed your windows, displaying messages in your windows can help animals. 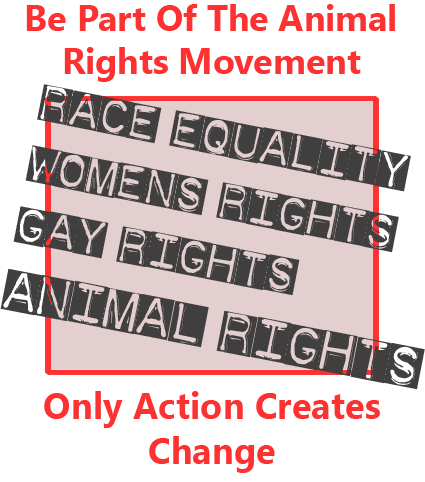 You can use stickers, posters, flyers (you can find free posters and flyers here), vinyl lettering, or anything else that conveys an animal rights message. You can even find pretty wooden hanging signs that display messages to help animals. If you have your own business, you can use your walls and windows to display messages. When you are communicating with people online or through speech, the most effective way to get your message across is to use non-accusatory, non-personal language. Otherwise, the person usually feels attacked and reacts defensively, digging their heels in, even if it is just to spite you. For instance, instead of saying “You can’t really be against all animal cruelty when you eat meat, because you fund cruelty towards certain animals”, it is better to speak generally and say “People can’t really be against animal cruelty when they eat meat, because they fund cruelty towards certain animals.”. There will still be people who take this personally and react defensively because they know they are guilty of what you say, but do not want to stop. The point is, you cannot be accused of personally attacking the person. This is important because onlookers are more receptive to what you are saying when they do not feel that you are personally attacking someone. If they think you are, they turn against you and as a result, turn against the cause. 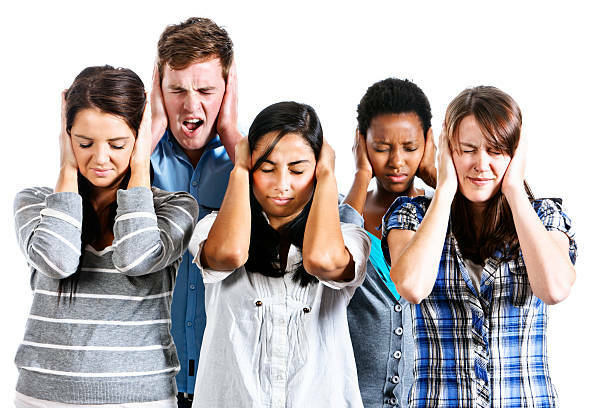 Another thing to remember is to sound calm, no matter how much you want to scream at the person (and you REALLY will!). When discussing it online with somebody who you are trying to get to see your point of view, avoid using exclamation marks and capitals, as this does not come across as calm. Find out more about the best way to affect change, whilst making sure you look after your own sanity, on this page. The best single thing you can do to help stop animal cruelty and suffering is to adopt a vegan lifestyle. 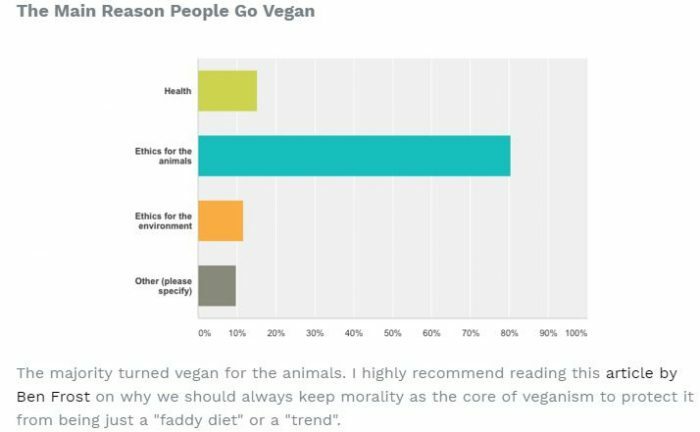 People often go vegetarian before going vegan. 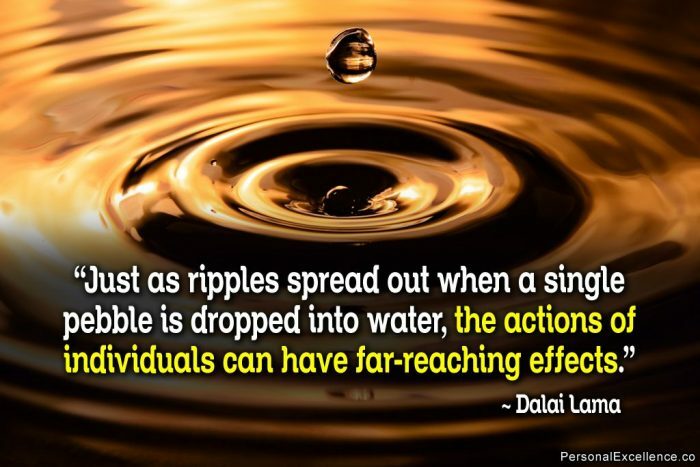 When you lead by example, people often show interest. They can have questions and can want to talk to you about it. By talking calmly and in a friendly manner, you can explain your reasons and let people know about things they may not realise. 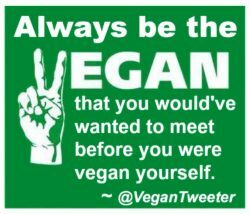 Be the vegan you would want to meet before you were vegan. Sharing information from this site on social media sites is a good way to raise awareness of how vegetariansim and veganism can make a huge difference to stopping animal suffering. However, you have to be careful to do it in a way that does not make people feel you are hostile towards them and attacking them. If they do, you will get their backs up, and then other people join in the argument, you will be accused of attacking people and being unreasonable, and nothing is achieved apart from a lot of bad feeling towards you and the vegan cause. The friendly, gentle, tactful, patient and persistent approach is usually more fruitful. Just planting the seed gives people something to think about. Find out what angle the person would most be interested in: Some people may not respond to the animal cruelty angle, but might be interested in fitness and a healthy lifestyle. In that case you may have more success talking to them about the health benefits of veganism. Others may be more concerned about the environment, or world hunger. In those cases, talk to them about how going vegan can make a big difference to those issues. 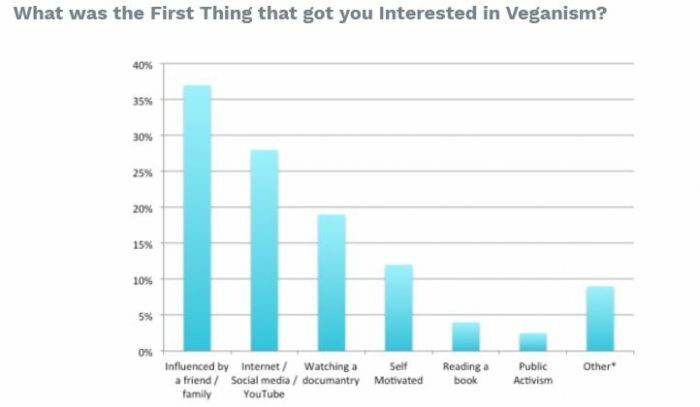 The trick is to find out what they are interested in and see if veganism could be of any benefit. If so, there’s the angle you should use for that person. It is a good idea to join vegan groups in your local area. There are vegan groups for local areas on Facebook, as well as national, general vegan groups. Joining local vegan groups is a good way to find other vegans in your area, and some might want to take part in vegan activism. One thing to do is to keep contacting companies asking them to take animal products out of their foods. 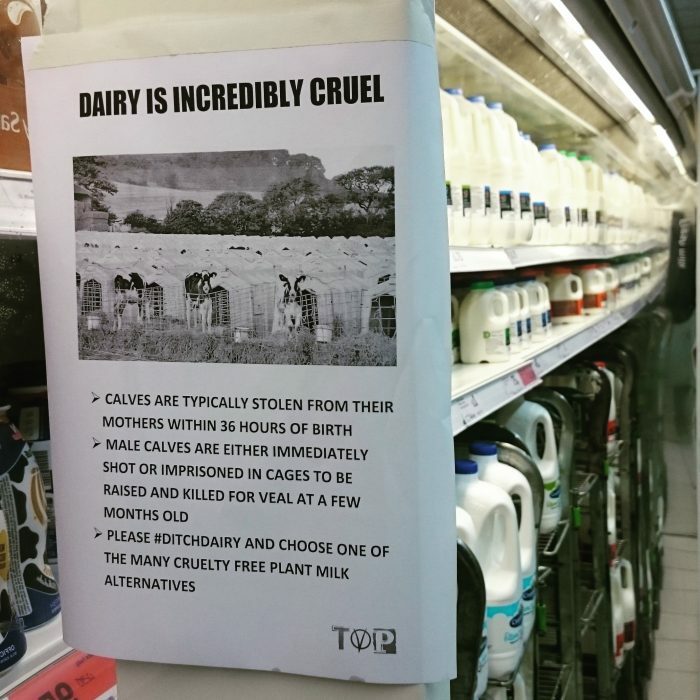 You can tell them that by having milk and eggs in their products, they are excluding whole markets of people, such as vegans and people with allergies to milk or eggs. You can remind them that the vegan movement is rapidly growing and that taking these ingredients out of their foods would see their revenue increase as new markets could consume them. I came across a very interesting and informative website that gives an insight into why people go vegan. It is a survey and is essential reading for anyone who wants to know the most effective ways to influence people. When you feel like you never get anywhere with anyone, think of it as planting seeds in peoples minds that need time to grow. They also need tended to and fed in order to grow. You can contribute to feeding it to help it grow, and it’s like;y others will too. The seed grows more easily in some people than others. Your messages about animal cruelty and veganism will be further reaching than you realise. You don’t know who will end up seeing the information you have shared online, or who will have read the messages on your clothes, and how they might be affected by it. There are many varied ways you can help stop animal cruelty, found in the Help Stop Animal Cruelty section of this website. There is something that will suit everyone, no matter what their personality, lifestyle or interests.